Understand what makes glass distinctive and valuable as a building material, including latest developments in how glass is made. Identify opportunities to enhance human experience and building performance through advanced glass capabilities. Recognize and respond to glass trends in today’s marketplace. Target key glass performance and aesthetic objectives with new tools that model glass applications in future building projects. 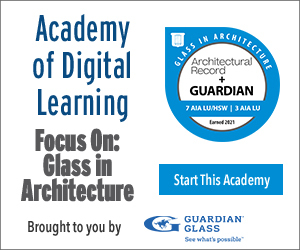 This course will explore the many things glass can do for you—the new and evolving ways you can use it to support your projects, the opportunities it creates for improving building performance, and how glass shapes the human experience. Glass Basics: What glass is and ways this material has evolved over time to keep up with changing needs and expectations. Building Performance: Ways glass can enhance building performance, with a focus on energy savings. Human Experience: What glass does for people who live, work, learn, play, and heal within the spaces that you create. Project Checklist: We’ll discuss a set of considerations you’ll want to have in mind as you embark on your next building project involving glass. Trends in Glass: We’ll share and discuss exciting application trends we’re seeing in the field. Modeling Tools: We’ll make sure you understand the tools you have at your disposal for simulating glass performance before you build your project.